Corsair's XMS (Xtreme Memory Speed) memory has long been popular among enthusiasts. Corsair has many such kits, and each is regarded as some of the best available in its category. 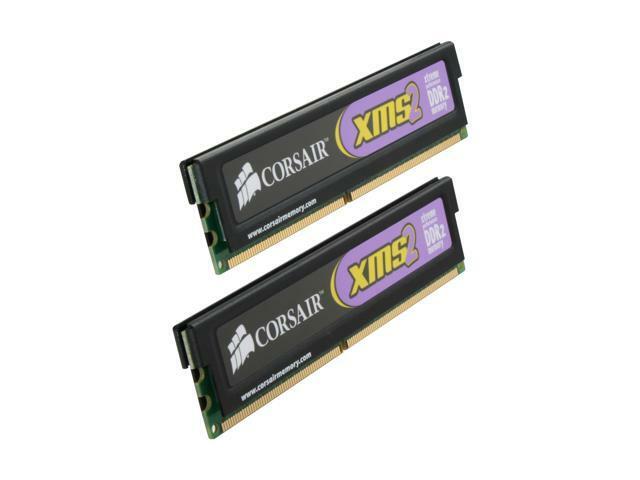 With 2GB (2 x 1 GB) of memory in dual channel configuration running at 800MHZ speed, this CORSAIR XMS 2GB DDR2 SDRAM System Memory, offers targeted low latencies of 5-5-5-18 at JEDEC standard speeds, overclockable to 4-4-4-12, and it's been certified as “SLI Ready”, giving you some screaming data transfer rates and exquisite renderings. These modules are made by Corsair using carefully inspected and matched RAMs. Running in dual channel mode, the module provides 12.8GB/s worth of memory bandwidth which happens to be exactly what the dual core Socket AM2 Athlon64 X2/FX processors need. What a coincidence. This is memory that’ll both overclock and stay cool, thanks to their huge black heatspreaders. This is a great kit for anyone wanting to max out their system’s performance! CORSAIR XMS2 Series TWIN2X DDR2 SDRAM The cutting-edge XMS2 series DDR2 memory from Corsair provides the best performance and reliability solution for any DDR2 motherboard. The Twin2X modules are tested in matched pairs at very aggressive latency settings for optimum performance and compatibility. DDR2 800 DDR2 800 delivers incredible performance and platform compatibility with up to 6.4GB/s memory bandwidth for the ultimate work and gaming power! Enhanced Performance Profiles Enabled Enhanced Performance Profiles, or EPP, enables advanced performance memory settings to be built into high performance memory DIMMs for even higher levels of overall PC system performance. NVIDIA SLI Ready The NVIDIA SLI Ready mark means that components are NVIDIA-certified for full equipment compatibility to raise the bar for performance and functionality with the NVIDIA SLI ecosystem. Enhanced Performance Profiles allow automatic overclocking to aggressive performance settings. Cons: had an onoging issue with 1 stick that cause more problems than I would have liked. Other Thoughts: Just wanted to add, even though they are no longer available, I still have these running strong in my PC and no issues. Pros: Well, I bought these back on 10/29/2007, and they are STILL going strong!! Although I've had to replace my motherboard once since then though, but these are still running great. And I run my computer, quite literally, 24/7. Only real exception to this, is when I shut it down to be cleaned or replace something in it. Cons: Corsair memory...and cons..? I don't personally feel that those two words EVER belong in the same sentence, just to be honest..
Pros: Got this in March of 2008, I reviewed it shortly after with a 5 egg rating, I do not regret that rating. Cons: 3 weeks ago I started having random BSOD, W7x64, more often under heavy ram usage. Ran Memtest86, 3 bad chips (1 good chip, which is how I am writing this). Last ran Memtext 86 about a year and a half ago, and was clear. Other Thoughts: If you think about it, 5 years of near 24/7 usage is not bad, I thought it was my cpu or RAID controller, but it was the RAM. I have had three HDDs die in that time, so I am quite happy. Pros: 5 years of use and still going strong. I run them the way they are and they haven't given me any problems.